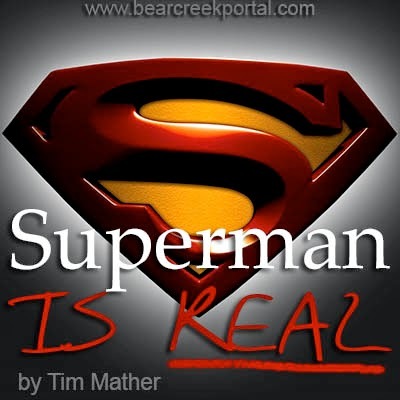 Bear Creek Trading Post: Superman Is Real! I am always intrigued by the imagination of man. For example, where did we get the idea of Superman? Stronger, faster, leaps tall buildings, sees through walls, among other things. Who is this guy and how was the concept conceived? I believe he actually exists. Let’s go on a search for the real superman. To review: The human race is a race of natural kings with rulership over the earth and all that it contains, except for other people; Adam and Eve messed up and forfeited their dominion for the sake of pride; the second Adam came – Jesus Christ – and recovered our original dominion . . .
imparted a whole new level of rulership. Hold on to your hat, we’re going for a ride. Then Jesus came to them and said, "All authority in heaven and on earth has been given to me.” Matthew 28:18. Last time we looked at the “all authority” part. Now, let’s discover what “in heaven and on earth” means. Obviously, there are two different origins of authority. Let’s assess the second one first. It is earthly, that is, of the natural realm on this planet. The Genesis 1:26 passage is the job description for the natural king as he/she rules over fish, birds, beasts, creepy things, and the earth itself. From the time of Adam and Eve to the time of Jesus when he was on the earth, human dominion was restricted. He multiplied matter, turning a few fish and a few pieces of bread into a feast, once for over four thousand (Matthew 15) and again for more than five thousand (Mark 6). He walked on the water (John 6:19). He ruled the wind and waves (Luke 8). He killed a tree with a word (Matthew 21). He showed us that instead of being ruled by the natural realm, we can now rule it. This promotes us to responsible kings tending the globe for our benefit. I’m reminded of the time when a well-known prophet was urgently asking Father why He didn’t dissipate the forces of hurricane Katrina. The revelation was clear: We, as kings, are responsible for our domains. Given natural dominion at birth, having been birthed again into the Kingdom of God, thereby receiving the upgrade to supernatural natural kings, we retain all the rights privileges and responsibilities of such authority. So, take care of your domain. I have decreed over my domain that there will be no tornadoes. In the years since I took this stand we have watched the weather radar as storms bearing tornadoes split in half and moved right around us only to join back together on the other side. We got exactly the amount of rain – to the inch – on the very day I chose. I’ve spent a bunch of time working on the weather, and now I’m practicing on fire ants. Father must have been in a really bad mood when He created those little monsters. He sent out the twelve to practice this new authority: As you go, preach this message: “The kingdom of heaven is near.” Heal the sick, raise the dead, cleanse those who have leprosy, drive out demons. Freely you have received, freely give. Luke 9:1-2. Here’s a little something to stretch your vision of what it means to be a follower of the King of kings: “And these signs will accompany those who believe: In my name they will drive out demons; they will speak in new tongues; they will pick up snakes with their hands; and when they drink deadly poison, it will not hurt them at all; they will place their hands on sick people, and they will get well.” Mark 16:17-18. And finally, our mandate: “I tell you the truth, anyone who has faith in me will do what I have been doing. He will do even greater things than these, because I am going to the Father.” John 14:12. Dominion was expanded from the natural to the supernatural the moment He got up and beat feet out of the tomb. Not only are we fully kings in the natural but are truly kings in the heavenly realms. As citizens of this Kingdom, we are authorized rulership over spirit beings, over sicknesses and diseases, over natural things that should kill us, and . 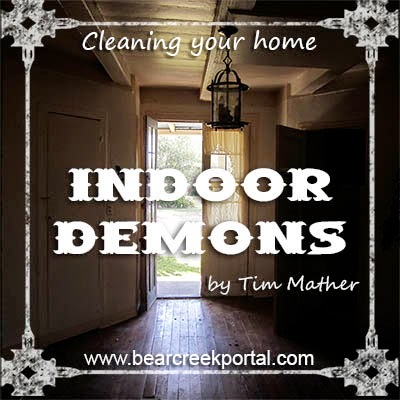 . . over death itself (once one is not ruled by the specter of death, what else is there to fear?). Word of Knowledge – Jesus, knowing their thoughts, took a little child and had him stand beside him (Luke 9:47). Discerning of spirits – Jesus rebuked the demon, and it came out of the boy, and he was healed from that moment (Matthew 17:18). He exhibited each of the gifts of the Holy Spirit except for the gift of tongues and interpretation. These He left for the Day of Pentecost to herald the entrance of the Holy Spirit into open Kingdom activity. He healed the sick, raised the dead, cured incurable diseases, and drove out demons as the normal course of action in the new Kingdom model. So, where are we? We argue over the stupidest things, like if the gifts are for today, and whether signs, wonders and miracles real, when these are the hallmark of Kingdom living. Why not practice being a supernatural natural king?